I have read "I thought it was just me (but it isn't)" and "The Gifts of Imperfection"--both by Brene Brown--and I knew it was time to take on the last book, "Daring Greatly." After all, so much of what I do as a writer is about going out on a limb and seeing what happens. I loved the first two books, but ever the skeptic I began to wonder, what in the world can a third book do for me at this point? I'm glad I didn't let that stop me from reading. Daring Greatly is a wonderful book that, if you can possibly imagine it, has further emboldened me in my life's journey. In the first two books, I learned how to stop feeding into shame culture, and how to let go of the need to be perfect and embrace who I truly am.... in this book? It's all about doing the one thing that most of us hate the most: being vulnerable. Turns out, if you really want to succeed in life and dare to live the life you were truly meant to live, well, that means being vulnerable. Following your heart takes courage and it takes vulnerability. Society has unfortunately confused vulnerability with weakness, and so first we've got to learn to break down that wall that society builds up. In this book, Brene Brown talks about what it is like to be Theodore Roosevelt's "man in the arena." (CLICK HERE to read Roosevelt's speech.) Most of us want to be daring enough to hop into the arena, but it isn't that simple. There is judgment waiting in the arena...there is an audience watching. Daring greatly comes with a ton of criticism, and that criticism can come from some unexpected places. As a person who tries her very best to dare greatly, both personally and professionally, I can attest that it isn't a cake walk. Sometimes it can be downright rotten. It can also be easy to confuse what success really means....for example, it's easy to think that our success is defined by how well liked our work is, but that isn't the truth. Sometimes the winning is just in the doing, and Daring Greatly puts this fully into perspective for the reader. 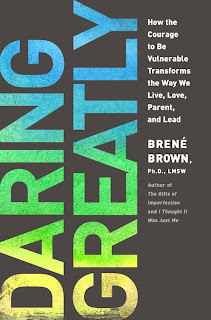 If you are practicing Wholehearted living, and you are ready to Dare Greatly, Brene Brown can help you silence the inner critic as well as the external critics you will come up against. This book is about learning to be vulnerable, and leaning in to uncomfortable situations in order to be our best, most authentic, most DARING selves!!! Brene Brown's down to earth style is empowering and highly effective. I love love love her, and so will you! So tell me, how do you Dare Greatly in your life?? Leave it in the comments section below!!! This book is changing my view on how I do things and making me want to be a better person! Love it and so glad I found it!! keep up the great work Brene Brown! !